This entry was posted in "Four legs good", Attempt at a Review, Favorite Perfumes and tagged 42 The Flower Shop, Jo Loves, Ramon Molvizar, Sun Sol. Bookmark the permalink. YES, finally! Great to learn about your summer holidays aquisitions from abroad. I got to try a few of Jo Loves fragrances when they were only getting started (and didn’t have brick & mortar store) and guess what, back then they easily sent me spray samples. I remember trying Green Orange & Coriander or Pink Vetiver. The vetiver was the last one I tried and since then I didn’t smell any of their newer offerings. I hope you’ll enjoy your 2 new perfumes (and that Clementine California too!) – shame that in Stockholm there was nothing from local brands that would impress you. It’s interesting that Molvizar is popular in Poland. But Spain is much closer to you than to me. If you get a chance, try Black Goldskin. On the positive side, they now have “pocket size” ($30 ml) perfumes in much more practical packaging for 89 Euro – not that bad for niche perfumes. Fingers crossed you’ll have a chance to complete this mission. What do you mean “would be”? Each of the previous three parts have that section :) Though, it looks like after more testing I still might go for a couple of perfumes I didn’t buy on the spot. It’s good to see you again, Lyubov. Ooh, I did enjoy this ‘final reveal’ post! And what a magical coincidence indeed that your London purchase had so many strands connecting you to it. I can imagine a flower shop in all its facets – there’s a lot of cut greenery – being a great inspiration for a perfume. How sweet is that picture of Rusty’s paw!! I like the sound of your Spanish purchase too, though I am ambivalent at best about the added sparkle. And La Tulipe would be gorgeous on a cold day. I associate it with a hot summer’s day in Dresden! Because of those gold flakes I’m hesitant to spray it on clothes: on skin it is quite noticeable. Before this trip I always thought of La Tulipe as about Spring/Summer perfume. But it was just gorgeous in cold weather. Lucas must be one of the very few lucky ones, because I very nicely asked if I could possibly have (or even pay for) some samples when Jo Loves launched and only got the paper strips! Maybe I will see what I’m offered when – spurred by your review – I enquire about The Flower Shop …. Dear, serious Rusty – he obviously gives great consideration to your purchases. Wait… While buying a bottle, all I was offered in response to my request for a sample of the second perfume that I liked, was that cure paper flower blotter sprayed ;) Something never changes. I do not have any warm feelings towards this brand. Loved this post. The “magical coincidence” makes for a lovely story and I can imagine No. 42 The Flower Shop being perfect straight from the fridge. I hadn’t heard of Ramon Molvizar but this perfume sounds fun for summer and that box made in Spain is great. 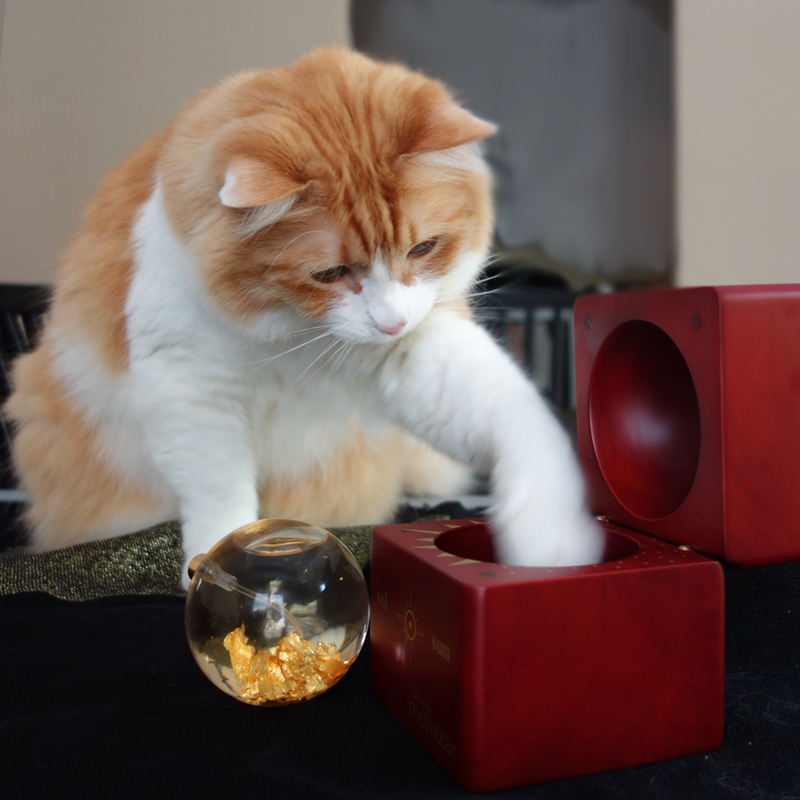 Adore the two pics of Rusty looking at the bottle and with his paw in the box! You now have that scent of memory of La Tulipe in Stockholm so it really doesn’t matter if you end up buying the bottle back home. I agree about the memory that will now connect La Tulipe and Stockholm, regardless of the place where I buy the bottle (and here it might be more economically sound). 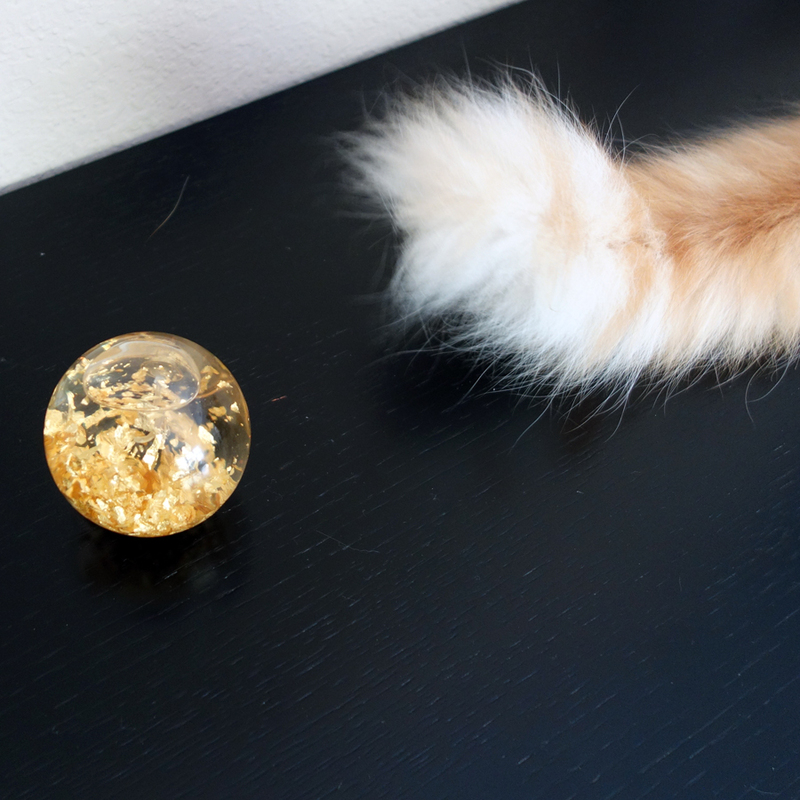 It took some … persuading to involve Rusty in that photo shoot (I had to bribe him with treats ;) ). I enjoyed hearing about your purchases and travels, Undina. As you know my blog kind of focuses on travel and scents so I am always keen to hear that other people plan perfumes for a trips location. I have wanted to try the Jo Loves line, but didn’t realize you couldn’t try samples. When I smell paper strips, the smell of paper overwhelms anything else for me. You would think, with all the articles about how she scents her house and lives with scent, she would be a little more aware? Perhaps its a cost issue? Anyway, disappointing. The one time I perfume shopped in London I went to Harrods and was so overwhelmed I walked away with nothing. The RM from Barcelona sounds like something I would buy. I also am really hesitant with full bottle purchases now, but went a bit crazy yesterday with sales at Twisted Lily and Luckyscent and bought Keiko Mecheri Isles Lontaines and the cherry blossom one by Berdeous. I’m sure Rusty is glad to have you back! Well, you can try samples… This brand has one of the meanest sampling program: you can pay for the future full 50 ml or 100 ml bottle (70/115 pounds) plus 35 pounds for ten 2 ml samples plus 5 pounds for the U.K. delivery (25 to the U.S.). 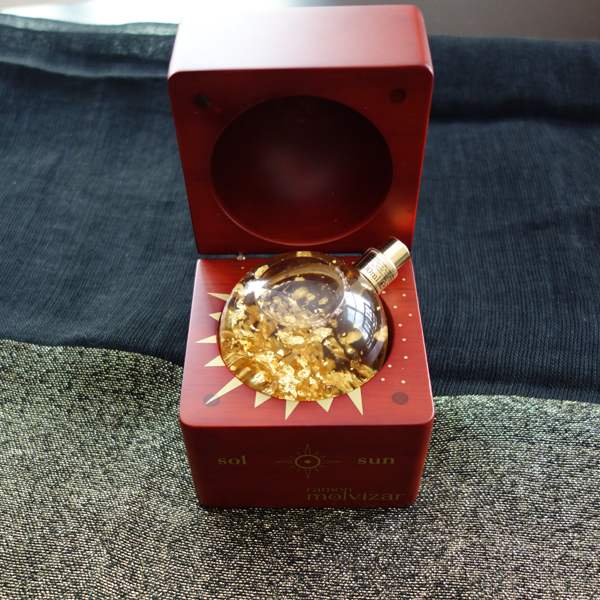 Total – 130/175 pounds, if you want to “try” their perfumes in the U.S. The price of samples isn’t deductible from the price of the full bottle. You cannot buy only the samples set. So it’s an interesting “gift experience” (yes, they call it like that). Once you decided “to try,” you’ve not only paid for sampling but already for the full bottle as well – even if you end up hating each and every scent. Obviously, it works for the brand, but I think it’s an unscrupulous scheme. Luckily for me, Luckiscent didn’t have anything I wanted to get right away but Twisted got some of my money in that sale :) I haven’t tried either of the two perfumes you bought but I hope to read your reviews for them soon. Rusty was indeed happy that we came back, which actually makes it so much easier to come back from vacations. 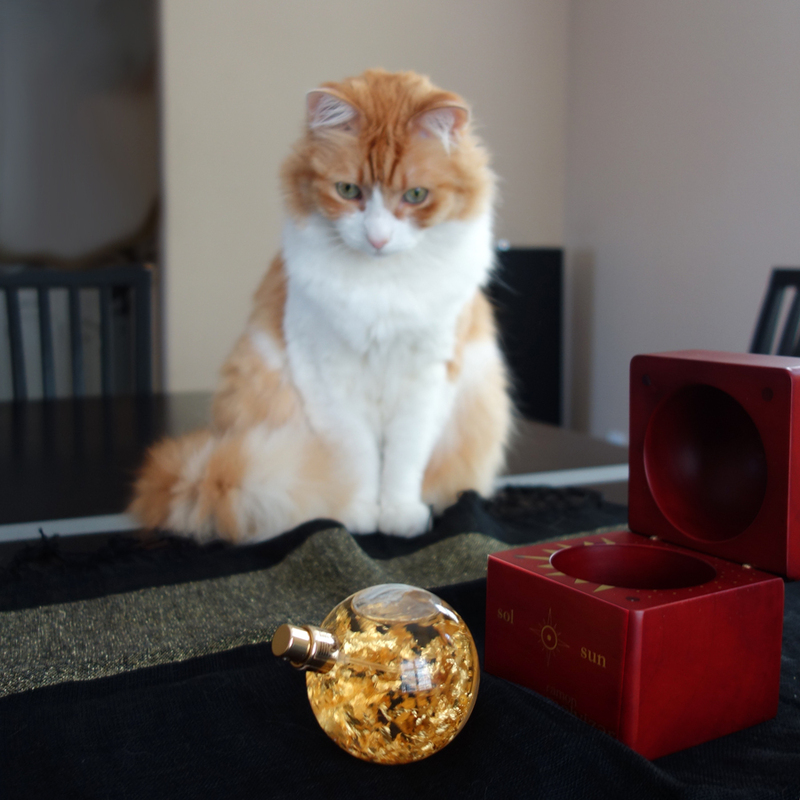 The older Rusty gets, the harder it becomes to keep his interest in my perfumes long enough to take good pictures. He still comes to check out anything new but he quickly figures out that it’s nothing he can eat or play with – and gets away before I get to him from the right angle. I’m loving the photos of Rusty with the Ramon Molvizar bottle! I love that bottle design in general and the fact that you can keep it in the (made in Spain!) box. No. 42 The Flower Shop looks and sounds absolutely lovely. Ms. Malone’s inspiration for the name is nice and nostalgic. I’m laughing about the fact that they offered you another scented blotter strip though, too ridiculous! The box is very well made! It’s a pleasure to handle it. I wonder if they would ever learn? There was a good chance I would have ordered that second bottle later after trying perfume a couple of times more at home. Now I doubt I’d ever come back to it. I always thought that customers who were already buying something else were good candidates for the further promotions… But clearly the successful business woman Ms. Malone is, she calculated it better. It just leaves a bad taste when company tries to nickel-and-dime me. Hey Undina! I love how you built up to your purchases! Your stumbling into Jo Loves was the exact opposite of mine. 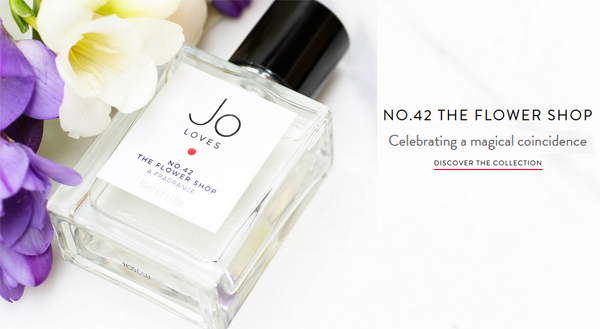 I targeted Jo Loves as the one and only perfume store I must go to since I had my voucher for a 50 mL fragrance and I wanted to pick it up in person. I wasn’t sure I was going to make it since it was Dec. 31st and I was enjoying a very nice tea at Fortnum & Mason with some fellow travelers but I zipped to Elizabeth St. in a cab. I’m glad you found your love there…I need to revisit once my set comes back again. I asked for samples too and the only one they had available (and I don’t really believe it) was Pomelo (which was the bottle i got with my voucher) and I gave it away to a friend. Had they offered the test strips only, I would have taken them, ripped them in front of the SA and left the debris on the counter (I know, so bitchy but what they did was beyond ridiculous). Your Barcelona purchase looks fabulous and it looks like Rusty approved with the “hidden” treat! I was so surprised with that offer to spray one more paper flower (as if I was too stupid to figure it out on my own) that I just dropped that topic without even suggesting to make it into a sample bottle that I had with me. I am very curious about Jo Malone’s new biz. Great story. Your cat is most photogenic! Tee hee! Great to hear. He’s a cutie. What wonderful acquisitions! and stunning bottles! Oh so I was interested to hear what you bought while on vacation- and you did like a Jo Loves! I am stoked, because I thought you might. Interesting that the choice came down to The Flower Shop and Thai Mango and Lime, with the latter not quite making the cut. I love florals, I love mango and I’m not a huge either citrus or Cologne fan – so I had less choices :) (though I like Gardenia as well – but I should finish the sample first). So I went to Jo Loves on my last trip to London and got the sample set/voucher for 50 ml bottle. I really thought No. 42 The Flower Shop would be my pick, too, and it’s lovely — but I have a lot of fresh green florals with LOTV notes. So I thought I should try something a bit different. I think I’ve narrowed it down to White Rose & Lemon Leaves, and Red Truffle 21. Did you try those too? What did you think? 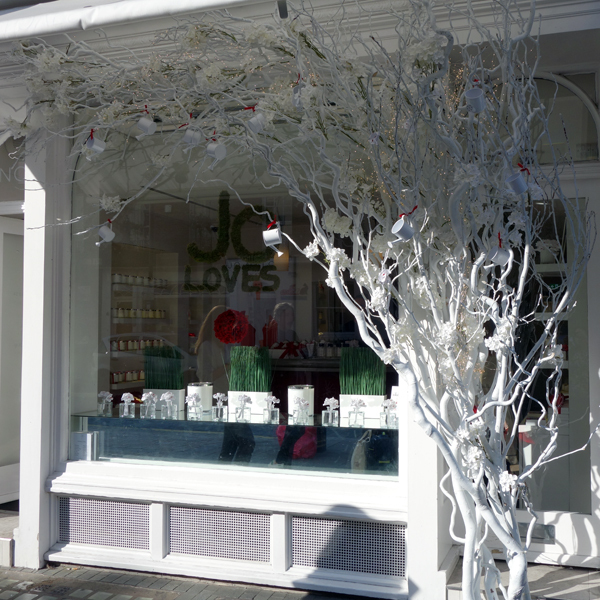 I tried all perfumes in the Jo Loves’ current line. Red Truffle 21 started pleasant but then went too much into the masculine territory. White Roses & Lemon Leaves started kind of OK and then got much better after an hour of development. So probably none of these will ever get into my collection but I’m glad these are out there.